version designed as monochrome engravings. folding top box; a storage box not worthy of the deck. For the price charged, this should be something more substantial like a small sturdy magnetic lid box. The cards are larger than poker or bridge size, which I prefer. They fit well into large hands but are not huge. The presentation is antiqued with muted Victorian colors. I find this visually calming and serene. The artist took some liberties with the images but most are easily recognizable. I had trouble with #24, heart, because it looks like an upper torso cadaver; #27 because it looks like a posted sign rather than a letter. The deck has a joker which I do not know how to use. The subject of each card in no way competes with a busy background. If anything, the artistic sty The card edges have a muted gold gilding which makes for a very respectable presentation of the cards. The card faces show the entire picture with the traditional playing card insert small and in the right upper corner and the card numbers in large Roman numerals at upper left corner. Card stock is good and has a snap to it. 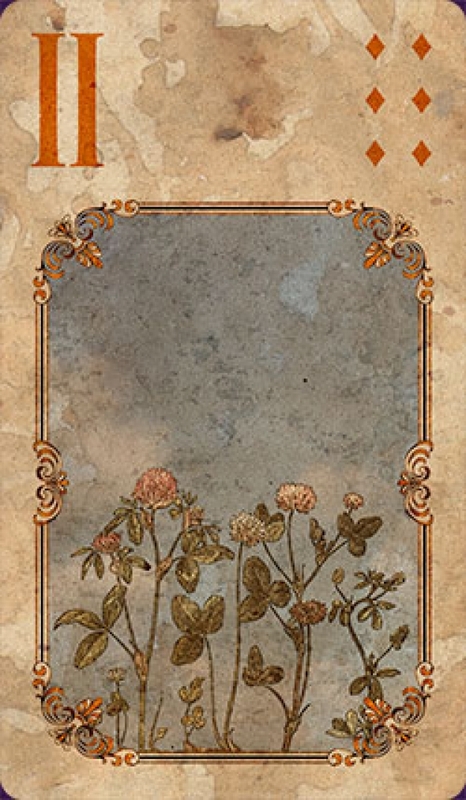 The overall presentation of this deck is, to me, consistant with how a Lenormand deck should look. Nice artwork, background does not compete with the theme which is easily recognizable. Images are serene and invite introspection. The cards feel good in the hand and are of sturdy stock. I highly recommend this deck.